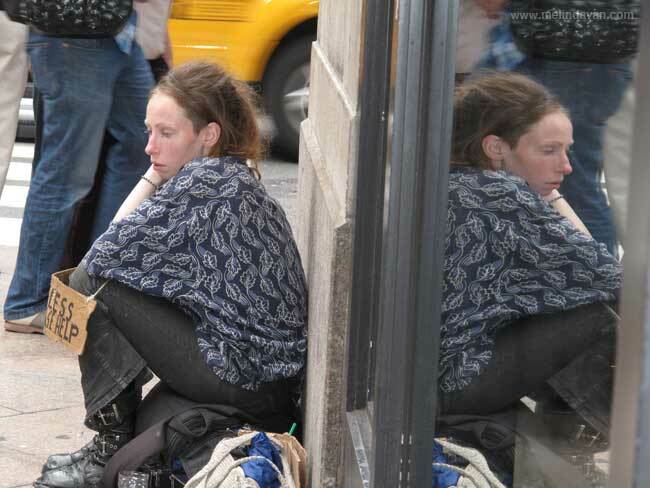 While in New York City I expected to see a lot of homeless people. It’s a big city, and that sadly seems to come with the territory. I was surprised how few I saw (I’m sure there’s a reason, one involving tourists and police and city image), and how they each seemed to have their own spot. I passed this woman, and a block away a homeless man, both of whom seemed camped out for the duration and neither of whom moved for hours. I walked by each several times and they were always there; a statue captured next to the hustle and bustle around them. It did make me stop and reflect. How far away from that corner am I? I’ve had days where I felt like this — I’m sure we all have. That look is despair, loss of hope, resignation to a fate that might not exactly be one we encountered by choice. Will I one day stand there holding a sign like that, with that expression on my face? Maybe I already have, but I’ve kept it inside. An invisible “help me” sign. She’s just brave enough to wear it on the outside.